In our earlier post, we have discussed on how to setup services for a single day with time slots using Specific Dates and/or Recurring Weekdays booking method. Let’s say you have setup all your services for a single day with timeslots and now you want that if a service is booked on a particular date and timeslot then the availability of other services on the same date and timeslot should get reduced by the numbers of quantity selected. In our Booking & Appointment Plugin for WooCommerce, we have Global Time Slot Booking option to reduce time slot availability of other services when a service is booked for the same time. You can find Global Time Slot Booking option at Booking-> Settings-> Global Booking Settings. Enable this option and click on Save Settings button so that this option will get saved. After enabling this option, once a service is booked on a particular date and timeslot then it will also check if the same date and timeslot is available in the other services or not. If found then its availability will be reduced by the numbers of the quantity selected for booking the service. We have Lockout Date after X orders and Lockout time slot after X orders options to manage the booking at a date and timeslot level respectively. If your service is setup with the timeslots then value to “Lockout Date after X orders” option should be the addition of the value set to “Lockout time slot after X orders” option for all the timeslots. I have set 3 as “Lockout time slot after X orders” option for all the timeslots of the classes which means only 3 students can attend the class on a particular timeslot. Based on that I have set the value to the “Lockout Date after X orders” option. As you can see in the below image, I have selected date 13th January 2017 for the classes and all the available timeslots on this date are listed in the timeslot dropdown. 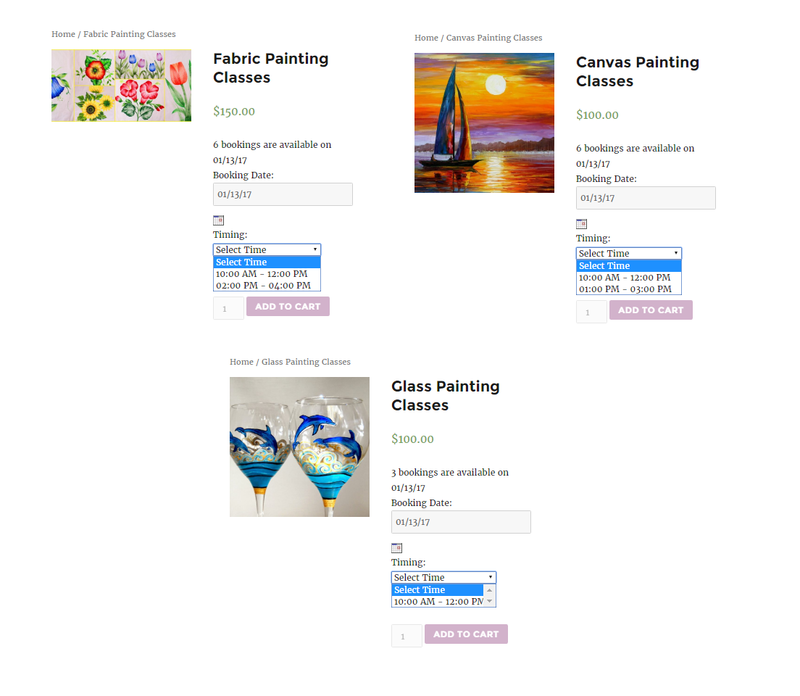 Let’s say if the customer is booking the Glass Painting classes on the date 20th January 2017 on 10:00 AM to 12:00 PM and if the same date and timeslot are available in the Canvas Painting and Fabric Painting then the availability of it should also get reduced. To do so, you can enable Global Time Slot Booking option from Booking-> Settings-> Global Bookings Settings and click on Save Settings button to save the setting. Now all the services of the same time slot are linked to each other on your store and if the user books one of the services on a particular time slot then this booking will be reflected on the same timeslot of other services. I booked Glass Painting classes for 1 student on “20th January 2017” for 10:00 AM to 12:00 PM time slot then the availability of the same date and time slot for remaining two painting classes will be reduced by 1. As you can see in the below image, the availability is now reduced by one on date 20th January 2017 for time slot 10:00 AM to 12:00 PM for all three classes. This shows the booking of a service on a particular date and timeslot is affecting the availability of other serviced on same date and timeslot. 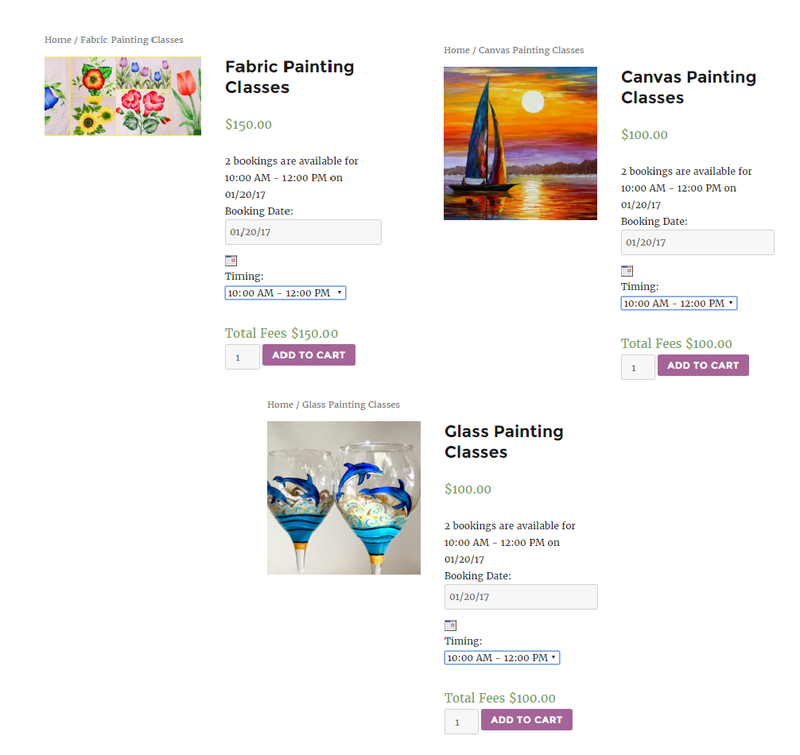 In case if the user books the Glass Painting classes for 3 students on the date 20th January 2017 for 10:00 AM to 12:00 PM timeslot then on this date the timeslot 10:00 AM to 12:00 PM will not be listed in the drop down for Fabric Painting and Canvas Painting. As the lockout of the timeslot has reached for these classes. Also, if you see the date 20th January 2017 will get disabled for the Glass Painting classes because the lockout of the timeslot has reached and no other timeslots are available on this date. Below is the image showing front end of all the classes after the booking. Global Time Slot Booking setting is applicable for the services having a common time slots may be all or some. This feature can be useful for businesses having limited manpower and can’t fulfill the requirement of the user in all places at a time. It’s very simple to set the Global Time Slot Booking for all the services of such businesses by just one click with our Booking & Appointment Plugin for WooCommerce. Freelancers like chartered accountants, tutors, personal trainers, etc., can’t provide their services at different places at a time. 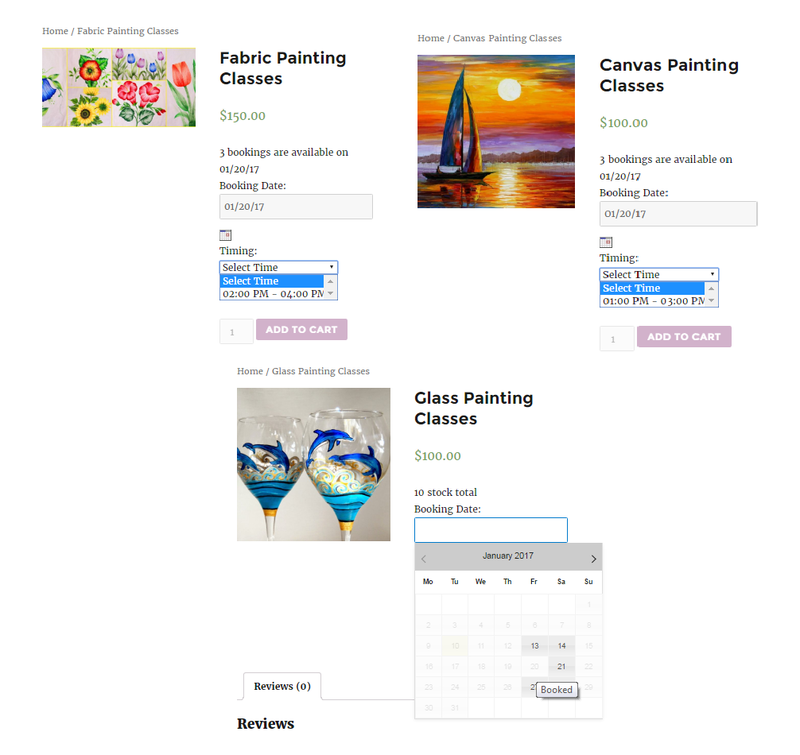 So setting their services with the use of Global Time Slot Booking with our Booking & Appointment Plugin for WooCommerce can make their bookings smooth and easy to handle.